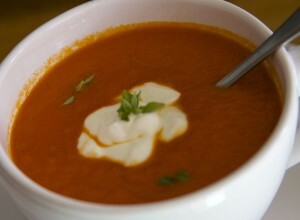 It’s about time I shared this recipe for my 5-a-day red pepper soup – it really is delicious and I have found that even really fussy eaters are willing to knock back a big bowl of this. Every time I make this soup, I wish I had remembered to make it more often! I had my oldest (as in known her the longest, she’s actually quite a bit younger than some other friends I hasten to add for the sake of completeness) friend over for lunch today. We don’t live within popping in distance of each other these days unfortunately so when she does come, I like to cook something special for her – I know, I am a feeder – I can’t help it! She usually likes homemade bread so I mentioned this to her when we were organising ourselves only to be told she’s on a diet so no bread. My 5-a-day red pepper soup is always a go to meal for me when I’m dieting – it’s filling and the peppers make it quite sweet so somehow it doesn’t feel like diet food! I’m glad to report she liked it too and I know I’m going to get asked for the recipe when she gets home so I thought I’d make a pre-emptive strike! Izzy is already eyeing up the leftovers – she prefers it to Heinz Cream of Tomato even as she says it isn’t stingy in her throat the way that tomato soup is. I think I know what she means! As with a number of my recipes of this type, you really don’t need to be too exact with the quantities. I really can’t be bothered with messing about weighing my carrots and onions and I’m sure you have better things to do with your time too! I used a carton pack of tomato as that was what I had – if you have a tin, I think they’re around 450g and that would be every bit as good and you really don’t need to adjust anything else. I have used two bell peppers and two of the long sweet red peppers that look like giant chillies. You could just use all bell peppers but I had the big pointy ones in my veg box this weekend. 1. In a large pan, sweat the onion, carrot and celery (I think this is what cheffy types call a mirepoix) in the vegetable oil until they are all beginning to soften, probably about 10 minutes. 2. Add the peppers, seasoning, water and tomatoes and bring to the boil. 3. Reduce to a slow simmer, cover and cook for 20 minutes, stirring occasionally. 4. Remove from the heat and blitz with a stick blender until smooth. If you prefer a thinner soup add a little more water from a freshly boiled kettle at this point whilst blitzing. 5. Garnish with a little Greek basil and a blob of fat free yoghurt. This entry was posted in Blog - Ramblings and Recipes!, Budget Cookery, Diet tips, Diet tips, Soups, Stealth Health Recipes. ← Exam time easy chocolate fudge! Pingback: New Year - New Diet! - This Secret Chef's Recipe For Feeding Five-a-Day To Picky Eaters!